Humanity is in a race, a kind of civil war. On the light side, the believers in a sustainable future based on clean energy fight to save us from climate change. The dark side defends the continuing use of fossil fuels, often careless of the impact it has on the world. Jeremy Leggett fought for the light side for a quarter of a century as it lost battle after battle. Then, in 2013, the tide began to turn. By 2015, it was clear the the war could be won. 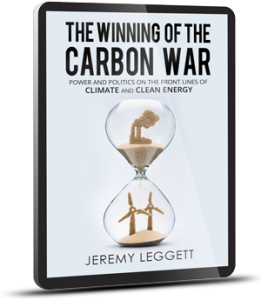 Leggett’s front-line chronicle tells one person’s story of those turnaround years, culminating in dramatic scenes at the Paris climate summit, and what they can mean for the world. In this updated edition, an extra chapter summarises the events of 2016 and 2017 as they appear from the vantage point of another climate summit in Paris on the second anniversary of the original.